Social Structure: Remember Your Class! Here is a section all about the last characteristic, social structure. Social structure splits us into groups depending on our jobs. Different people have different classes. On this page you can learn about other classes and your class. The members of the top class are priests, land owners, kings, and government people. The king lives in a large palace, while the priests, land owners, and government people live in big houses. 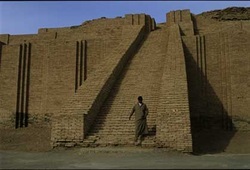 Above is a picture of a ziggurat, a temple where priests give offerings to gods. The middle class includes merchants, craftspeople, farmers, and fisherman. They live in houses with one or two floors. The merchants and craftspeople live near the other houses, the farmers live near the farms, and the fisherman live near the rivers. Above is a picture of some pottery created by craftspeople. In this class are the slaves. They usually live in houses owned by the people they work for. They don't own any land and don't have many belongings. The slaves clean, cook, and do other chores in the house of the people they work for.